My God, my God”, Wangari Maathai exclaimed, when the Director of the Nobel Institute called her on a poor mobile phone connection to tell her that she had been awarded the Nobel Peace Prize for 2004. She bubbled over with joy, and the news was all over the world in an instant – a good twenty minutes before the official announcement in Oslo! At the time Wangari Maathai was visiting the little village of Ihururu, 95 kilometres north of Nairobi, distributing food from the government. Her Kenyan listeners – mostly women – clapped politely when she told them that she had been awarded the Peace Prize. But they laughed out loud when she told them that she had been given so much money that she couldn’t even count it. female professor at the University of Nairobi. As a biologist, Wangari saw the problems that deforestation and soil erosion were causing in rural areas, especially for the women who do most of the physical work. Grazing areas for livestock were being destroyed. The women were having to go further and further in search of wood for cooking. In 1977, Wangari made an important decision. She resigned from her chair, and on June 5 (World Environment Day), she planted nine trees in her backyard and founded the Green Belt Movement. Today, the Green Belt Movement is one of the most prominent women’s civil society organisations advocating human rights and supporting good governance and peaceful democratic change through the protection of the environment. Its mission is to empower communities worldwide to protect the environment and to promote good governance and cultures of peace. What was your reaction when you learned you had been awarded the 2004 Nobel Peace Prize? At first, I was overwhelmed. The Peace Prize is an honour like no other. I was surprised because I had no idea that anyone was listening. I quickly realised that although I had been given this great honour, the honour was not just for me. It was also for the thousands of women who planted thirty-million trees throughout Kenya as part of the Green Belt Movement. Just about an hour after receiving the news, I celebrated by planting a tree in Nyeri, my home region, in the face of Mount Kenya. Throughout my life, the mountain has been an inspiration, as it was to generations before me. I called on all those who care for the environment around the world to plant a tree, too. I hope millions are planted. What are the origins of the Green Belt Movement? I have always loved nature, but I became aware of the connection between environment and people’s lives in the mid-1970s. Rural women I met through the National Council of Women of Kenya, in which I was an officer, related their needs to me. They said they did not have enough wood for energy or good sources of clean drinking water, or enough to eat, especially nutritious foods. I saw that the common thread in all of this was that the environment around them was in decline. Trees were a good solution. Trees could meet women’s immediate needs and also help restore degraded ecosystems. I began to work with the women to grow tree seedlings and plant them on private land. Women were compensated for their seedlings so they got a small income. It’s been a tough struggle for you working with the Green Belt Movement. You have been beaten, jailed, vilified publicly and had death threats. What was most difficult thing you have had to overcome? The most difficult aspect was the fact that the former Government was completely against the Green Belt Movement and our work of mobilising women into groups who could produce seedlings and plant them. The Government was also against the idea of educating and informing women. It didn’t want citizens to know that sometimes the enemy of the forests and the environment was the Government itself, which was supposed to be protecting the environment. If citizens saw the linkages they would put pressure on the Government to improve governance; to create democratic space; to help them protect their environment; and to be responsible managers on citizens’ behalf. When we were beaten up, it was because we weretelling the Government not to interfere with the forests. We were confronted by armed police and guards who physically removed us from the forests, as we sought to protect these green spaces from commercial exploitation. Sometimes in the process we got hurt, arrested or thrown into jail. People often ask me why I was not afraid. The best way I can explain it is to say that I did not project fear. Quite often when we project the consequences of our actions, then of course we can feel fear. If you project that you might die, that you might lose the privileges of the position you hold, that you might be fired, you begin to focus on the consequences. But if you stay focused on what you want to attain, then you actually go right in there where many people would not dare to go. It’s not that I am brave, or that I do not see the consequences. But by not projecting it, I do not embrace the fear that so often stops us from pursuing our goals. Those of us who understand, who feel strongly, must not tire. We must not give up. We must persist. I always say that the burden is on those who know. Those who don’t know are at peace. It’s those of us who know that get disturbed and are forced to take action. What advice would you give to the youth and what they can do to protect the environment? I would like to call on young people, in particular, to take inspiration from the Nobel Peace Prize. I want them to know that despite the challenges and constraints they face, there is hope. I want to encourage them to serve the common good. My experiences have taught me that service to others has its own special rewards. I also have a lot of hope in youth. Their minds do not have to be held back by old thinking about the environment. And you don’t have to be rich or give up everything to become active. Even simply using both sides of a piece of paper before recycling is conserving the environment. The situation, however, is serious because the youth of today will experience the consequences of their elders’ mismanagement of the environment. Unless we change course, the coming generations will inherit an impoverished environment that will mean a hungrier, less fertile, and more unstable world. More conflicts will erupt. Young people need to become involved in promoting environmental sustainability. Through the Green Belt Movement we have helped young people get involved in environmental activities. We have tried to instill in them the idea that protecting the environment is not just a pleasure but also a duty. What is the responsibility of governments in ensuring environmental protection? In Kenya, the area of forested land has declined to less than two percent, and the UN Environment Programme recommends a minimum of ten percent for people. For people to thrive, the environment that sustains them must thrive. Governments need to be at the forefront of environmental protection. Without specific laws that protect the environment it is difficult to see how any delicate ecosystem can survive over the short-term, let alone the long-term. Unless there is political will and public acceptance of environmental protection around the world -because environmental management and protection is a global concern and responsibility – then the enormous benefits the environment bestows on us may be lost, and future generations will pay the price. The Nobel Peace Prize will make me work harder for the years that are left and inspire others so they can walk along the same path I have for the environment and for the good of the people and the world in which we live. I want to focus on expanding the impact of my work. I hope I will be able to do more. I want to empower a larger constituency to embrace environmental conservation as a means of achieving democracy and peace. I also want to promote cultural preservation, and encourage people to deepen their commitment to democracy and peaceful co- existence. 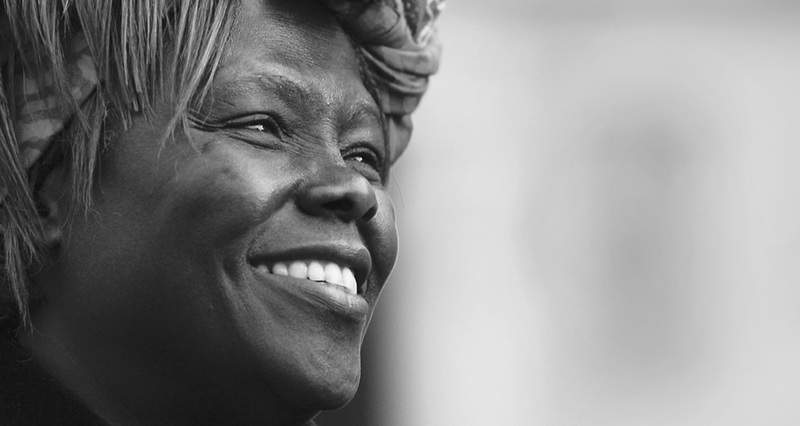 I am establishing the Wangari Maathai Foundation to strengthen and expand my work. I believe I am fulfilling the mandate of the Nobel committee when they recognised that my work was contributing to peace. We still have a lot to do. We know that the little we are doing is making positive change. If we can multiply that several million times, we can change the world – definitely. "Those of us who understand, who feel strongly, must not tire. We must not give up. We must persist. I always say that the burden is on those who know. Those who don’t know are at peace. It’s those of us who know that get disturbed and are forced to take action."